ounce of beaten ginger and halfe a mutchkine of [tryakle?] and if you have not [tryakle?] 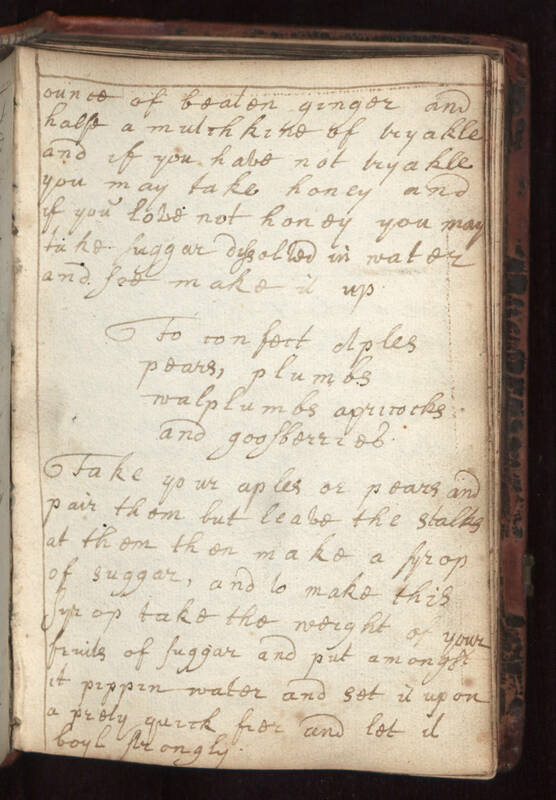 you may take honey and if you have not honey you may take suggar dysolved in water and soo make it up To confect Aples pears, plumbs walplumbs apricocks and goosberries Take your aples or pears and pair them but leave the stalks at them then make a syrop of suggar, and to make this syrop take the weight of your fruits of suggar and put amongst it pippin water and set it upon a prety quick fier and let it boyl strongly.